We have now been in our new production facility for five years and sales are through the roof! 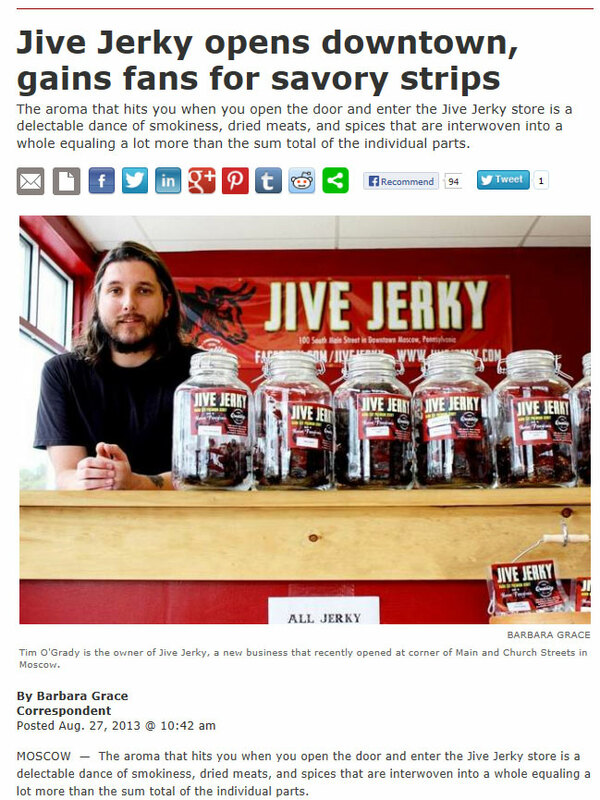 Jive Jerky has received a lot of media coverage since we opened in Moscow in 2013 for being a unique business. 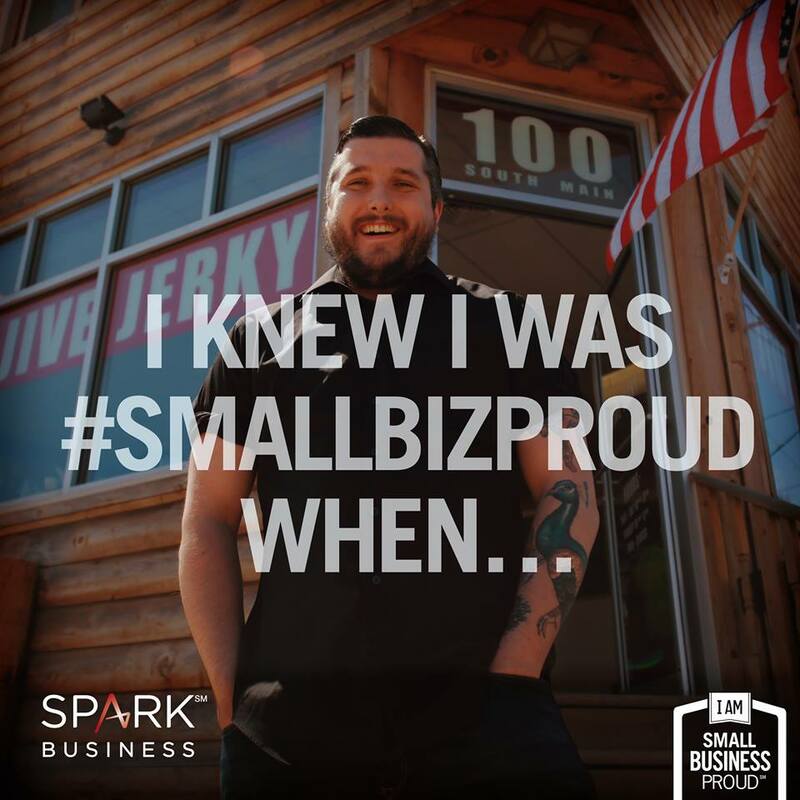 Capital One has even featured Jive Jerky in a documentary on small business in the US. Jive Jerky was selected by Capital One as one of four businesses in the USA to do this commercial. 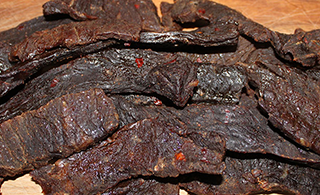 Jive Jerky is hand-cut jerky from the Pocono Mountains of Pennsylvania. Our goal is to provide the masses with a GREAT TASTING, alternative to the chemically comprised big brand jerky currently on the market. What makes JIVE JERKY so good? JIVE JERKY is all fresh, USDA inspected meat – never frozen. We hand cut our jerky so you get only solid, lean meat and nothing else. Our meat is neither ground up or pressed; and there are no additives. The recipes for our jerky marinates are all our very own original recipes and are mixed at the time of use. We want to make sure that you get the best jerky possible! Our recipes have been painstakingly perfected over the years with emphasis on flavor and quality. In recent focus groups, Jive Jerky products have outperformed the competition. 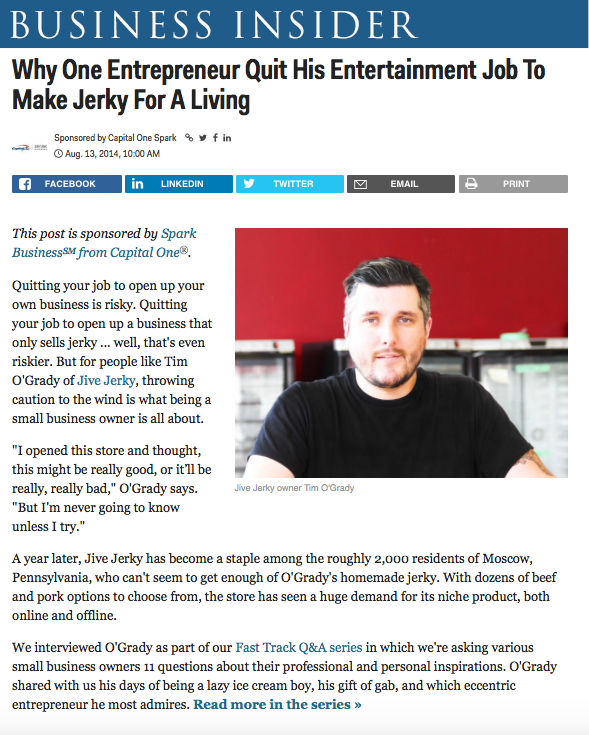 Capital One does a documentary on small businesses and interviews Tim at Jive Jerky. Click here to watch our segment on WNEP Home & Backyard that aired September 14, 2013. If you love fresh fuit, you'll love our Jive Fruit - a convenient way to take whole fresh fruit with you anywhere your busy day takes you. Jive Fruit starts as whole fresh fruit that is washed and cut. It is then pureed and a smidgen of agave (the stuff they make tequila out of) is added to it. After it is dehydrated, it is cut into small sheets on parchment paper so you can pull off a sheet and roll it up or fold it. The fruit is vacuum sealed so you can take it with you anywhere. Jive Fruit is all-natural and has no other additives or preservatives. Learn More Our jerky is small batch hand-cut and prepared to ensure you get the best cuts of met and quality product possible. Fruit Leathers (Roll-ups) made from fresh whole fruits like strawberries, raspberries, blueberries, peaches, kiwi, cherries, bananas, plums, and more. Closed the following holidays: New Year's Day, Easter Sunday, Memorial Day, July 4th, Labor Day, Thanksgiving Day, and Christmas Day. Jive Jerky®™ is a registered trademark.